A meal is provided each week consisting of Ugala, rice, beans, and sometimes chicken. This Sunday meal includes time for a message from the word of God and singing. Cost for each meal currently runs about $150 (this covers the food for the entire group, which usually averages between 100 and 200 boys, plus the rental of the building). Regular weekly or monthly contributions will be appreciated. Younger boys, who have been on the streets for a short time, but long enough to have experienced the realities of street, are prime candidates for rehabilitation. Boys who are open to this will be accompanied by a caseworker or pastor and will receive counsuling along with the parents or guardians. Often the issues that drove the child to life on the street are minor and can be resolved. Funding for a four-wheel drive vehicle is needed to get this program in high gear. One-time donations or grants would be wonderful. This physical facility will be centrally located to provide easy access to any of the thousands of boys living on the streets of Kisumu. Services provided will include: Temporary shelter from the weather. A basic meal for anyone in need, medical assistance, shoes and/or clothes as available. Funding is needed for the purchase of land and construction of a basic shelter which includes a covered area for cooking and feeding, and a secure area for storing food and other supplies. One-time donations and grants for the start-up, land purchase, construction, and supplies will be a Godsend. Monthly contributions for supplies and around the clock staffing will allow many to be blessed and many to share in providing the blessings. Many of the boys on the street have lost their parents and have been attending school prior to the tragedy in their family. We envision a facility where boys who have demonstrated the skills and determination to complete their schooling can live in a family type environment. This facility will be located on the outskirts of Kisumu where land is less expensive and the temptations of street life are further away. One time donations and grants will be needed to purchase land and construction of the housing facility. Regular, monthly donations will provide for food, clothing, school fees and uniforms. A donation of $25 will provide medicine for treatment of malaria or wounds which are both common among children living on the streets. 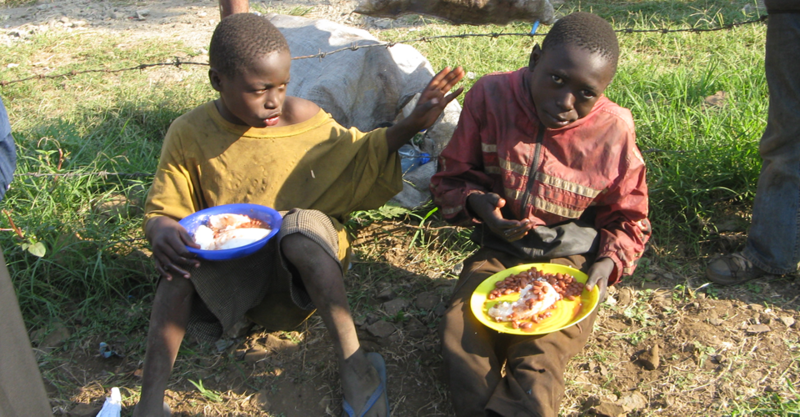 A donation of $50 will provide a meal for 50 boys. A donation of $100 will provide for the monthly rental of the facility used for the weekly worship and feeding program. For information about how to help fund one of the major long-range initiatives, please email Charles@lifeforchildrenministry.org. If you would like to receive a year-end statement of your contributions please send an email to: statement@lifeforchildrenministry.org; providing your first and last names, and your complete mailing address.